OK so the world has been going steadily downhill for last 5774 years. The trouble began with food which will eventually be my focus. But first a few disjointed musings. Most of our problems result from misdirected attempts to make things better. There are few Iagos in the world. This (the desire to do good devoid of rigorous analysis) is how almost one in six Americans (many of whom are obese) ended up on food stamps. Basically the failure to temper the desire to aid the less fortunate without grasping the tragic nature of humankind is the cause of most of the mischief breaking the bank in the developed world. The United States was founded on the principle that men were not angels and therefore needed government. But as governments were nothing more than collections of men, government workers would certainly be less than angelic and could not be trusted with power without rigorous limits. This was not a new idea thought up by Madison and his coevals. Of the 613 commandments in the Law of Moses 60% (365) are negative; ie they are prohibitions. Thus for thousands of years we have known that if left to their own devices men are often apt to do the wrong thing and need constant reminders (both divine and human) to stay straight. And that reminders not backed up by force will not suffice. Ultimately, the warrant of government is enforced by men with guns. If the stock market is a constant struggle between greed and fear, government is the conflict of security with liberty. Just look at the news as it flashes across your monitor. Obamacare, military intervention in the Middle-East, taxes, the welfare state, crime, the IRS, email surveillance – they are all their center variations on the same basic struggle. Which one? Take your pick. Which brings me to my subject – Hostess Cupcakes. The Hostess Cupcake was made by a company founded in 1930 which operated under a series of names (the last was Hostess Brands) until it went out of business in 2012. It also made Twinkies which don’t interest me and won’t be discussed here. The immediate cause of the company’s demise was the failure to resolve differences with its unions about pensions. Rather than suffer a reduction in salary and benefits the unions chose liberty. In this case the freedom to forgo their jobs. After the company ceased operations, Apollo Global Management bought the snacks business of Hostess Brands for $410 million. 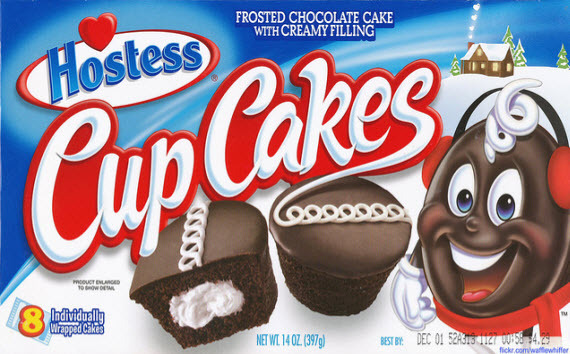 Hostess Brands LLC reopened the Emporia Kansas plant and resumed the manufacture of Hostess Cupcakes. I do not know what, if any, arrangements the company made with the unions that had represented the old company. The new pastries began to appear in store around the middle of July. As a boy I had consumed prodigious quantities of Yankee Doodles. 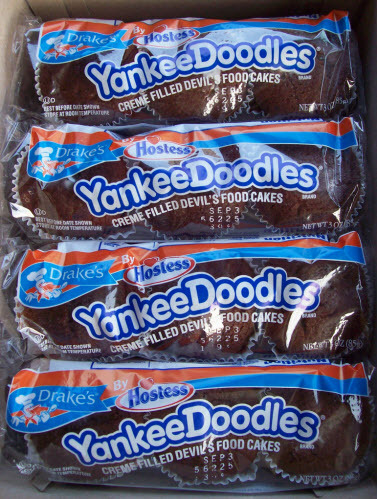 But when I moved from New York they were replaced by Hostess Cupcakes as Yankee Doodles were not available nationwide. Incidentally, for a while both confections were owned by the same company. As a boy I was slimmer than barbed wire and thus my consumption of Yankee Doodles was limited only by my parents’s parsimony and concern for my survival. Maturity of course brought restraint and I limited myself to no more than two Hostess cupcakes a day. When Hostess went under I did not share the nationwide sense of national decline engendered by the loss of Twinkies. It was the disappearance of Hostess Cupcakes that had me reeling. I bought up the few locally remaining specimens, but of course this was no solution. Cupcakes are transient, temporary, fleeting. As I ate my diminishing stock I felt like the Iroquois eating their seed corn during a famine. Then they were gone. I was desolate. I tried other brands; some looked like the real thing, but none had the sublime delicacy, the ambrosial cream center, the marvelous mixture of smooth and spongy chocolate. Eating these imitations was like being forced to drink Asti Spumante after a lifetime of Dom Pérignon. Then the reprieve. They were to return in July. But they were a no show in West Texas. I kept searching for them at the local supermarkets, but they were not there. I was such a nuisance the managers at these emporiums locked themselves in their offices when they saw my car in the parking lot. One store even banned me. It’s hard to become persona non grata at a United Supermarket. I tried to get a grip on myself, but another conflict like those above appeared – appetite versus self control. No surprise the winner. So I went to the source of last resort – Amazon. They had them (you know what) or rather one of their resellers had them. Eight cupcakes for $12.88. That seemed outrageous, but I was too blinded by malign emotion to resist and I ordered a box. It arrived Aug 21. There’s a Best By: stamp on the package. See the lower right corner of the picture above. It was covered with a white label. After I tasted one of the cupcakes, I peeled the label off. It took about 20 minutes to remove it so tightly was it affixed. It said Best By: Aug 22. There was no year. The taste suggested that Howard Carter had found the cupcake next to King Tut’s mask. The creamy center of the confection was homeopathic. I tasted two more of the cakes; they were as mummified as the first. The box went into the trash. They were a lesson in restraint or, rather, the lack thereof. So it appeared that Scott Fitzgerald’s aphorism about second chances applied to pastry. Regardless I was desolate, bereft, not to mention empty. I was in a dessert desert without a bakery or oasis in sight. All important events in life, good and bad, are surprises. Five days later three boxes of Hostess Cupcakes appeared on my desk like Henry Stanley from the Congo. My wife,(who is smarter, more observant, and resourceful than I) had noticed my confectionery confusion. You didn’t have to be smart, etc to notice this, proximity was all that was needed. Ozymandias’ statue would have detected it in an instant. But she took action. To begin with she was on very good terms with the manager of the store that had banned me. As she often uses her maiden name he didn’t realize that we were related. In the strictest confidence he told her, after she let slip a casual remark about cellophane wrapped treats, that the store had a cache of Hostess Cupcakes that were only sold to its best and most personable customers, a category from which I was obviously excluded. If she promised to keep all this on the qt he would let her have three boxes a month of my palate’s desire and at $3.50 a box; close to a quarter what I had paid Amazon for a fossilized specimen. The cupcakes she unobtrusively deposited on my desk were obviously from a select vintage or a limited run. The covering chocolate top was smooth and delicious as was the cake it covered. The cream center was copious and gently enclosed in a commodious space. She allowed me one and then locked the rest in a sealed refrigerator she keeps for her private comestibles. If I water the plants, in doors and out, she gives me one every day at noon. I’d water the Sahara if she asked. So while the problems and issues I started this piece with remain there is one less. You can go home again and there may be another act after the intermission and you may be able to get some satisfaction and most importantly you can eat your cake and have it too. Over 45 years ago I forced myself to discard such ‘foods” as they made me feel exhausted all the time. The only ‘sin’ I allow myself now is Mrs May’s Ultimate Crunch……lots of nuts, seeds and dried fruit. The hardest item to give up was coffee (which had a similat effect on me….gave me exhaustion instead of energy. It took 3 attempts over several years to give it up. I was never addicted to any brand as I made my own ‘sins.’ Ah, those meringe crusts. In South Africa they are such sugar freaks that teacups were 1/4 filled with sugar before adding the tea. And tea time was twice a day at work….and who knows how often at home. Also, there was a popular item like a glazed donut, but instead of air chambers the hollows were totally filled with sugar syrup. I can’t remember the spelling, but it sounded like ‘cooksisters.’ One lady refused to travel as she couldn’t be a day without her cooksisters.